Everything I own wears out. My car breaks down. My shoes fall apart. My house needs repairs. Now, I am grateful for my “stuff” and I use all these things, but I can’t trust in them. No matter the quality or the cost, EVERYTHING wears out eventually. The Lord is forever, eternal, EVERLASTING. My trust in Him doesn’t depend on what I do — how often I go to church or say my prayers or be nice when I want to be rude. 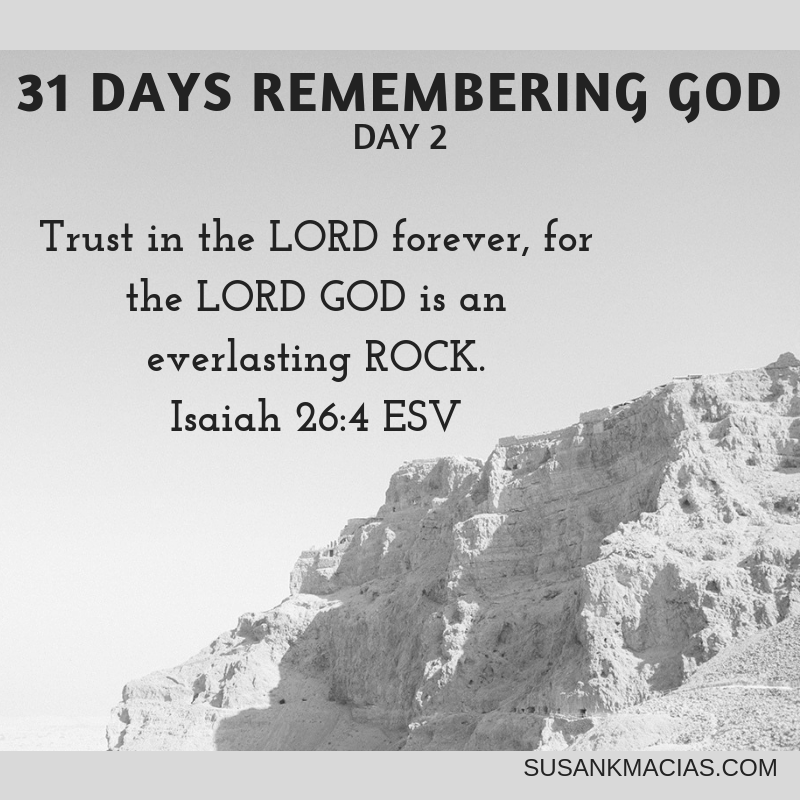 It rests on the secure rock and foundation of my Lord Who NEVER wears out. I can’t out run Him, or out last Him, or out do Him. My faithful Lord is forever. His love for me is forever. That amazing fact is worth remembering! PRAYER: Lord, thank You that even is there is a “flood” — a problem, challenge, illness, difficulty — You remain on Your throne forever. Please rule over every messy part of my life. PRAYER: Lord, thank You that Your plans stand forever. I am so grateful that nothing that I do or my kids do is outside of Your hand. Your everlasting Lordship remains, no matter how badly we mess up. PRAYER: Thank You Lord that Your love is FOREVER. What does it mean to you that God is EVERLASTING? How does that help you trust Him? If you are using a journal, write your answers down there. Meditate on “The LORD is faithful in all his words and kind in all his works.” (Psalm 145:13) for a few minutes. How would truly believing that verse change your attitude? What challenges do you face in 2019 that you need to remember God rules over? No matter what happens, Jesus remains Lord. Take your journal or a piece of paper and write down every thing in your life that makes you feel unloveable. Be honest. No one else needs to see this. Then take a red pen (or whatever color you like) and write: My steadfast love I will keep for him forever (Psalm 89:28a) over the top.